Disclaimer: This post contains affiliate links. Clicking on a link and making a purchase will result in me receiving a small percentage of the sale at no additional cost to you. I don’t know about your kids, but my 3 year old has to do whatever his sister is doing, so we’ve been at this homeschooling thing for a bit. I was using just a hodge-podge of Dollar Tree workbooks and coloring books with him (after all, $1 is a very reasonable price for things when he goes through these books as fast as he does), but this month, we’re starting some more formal lessons. He already knows his letters, shapes, numbers, and colors, so my goal is to work with him on his fine motor skills and solidify what he already knows. I don’t want to do a lot with him, but just enough since he insists. Here’s what we do, it takes less than an hour a day (with the 20 minutes of reading books factored in. I liked the level one books so much, I made the decision to order the pre-reading program for him as well. He loves that his “learning activities” look like his big sister’s, and I like having things laid out in a lesson plan. We’re still also doing various things we’ve picked up from the dollar store as the extra practice. I’m using a couple of things – Critical Thinking Company’s Mathematical Reasoning Beginning 1 and Kumon Numbers 1-30 are the two main resources I’m using. I have other things that I pull out from time to time, but these are quick and simple. Mr. 3 is taking an art class that meets once a month, and he’s always coloring or painting something. We listen to a variety of music and talk about the composers and artists. Literature, History, Science, STEM etc. We’re members of the Amazon STEM toy of the month club. We also use What Your Preschooler Needs to Know. We read a large variety of books in addition to what we do for reading. Mr. 3 also does a basketball class, zoo class, and a dance class. Mostly, he plays, as well he should at this age. The only reason we do anything formal is he’ll be all up in my face begging me to do something when his sister is learning if I don’t give him his “work” first. 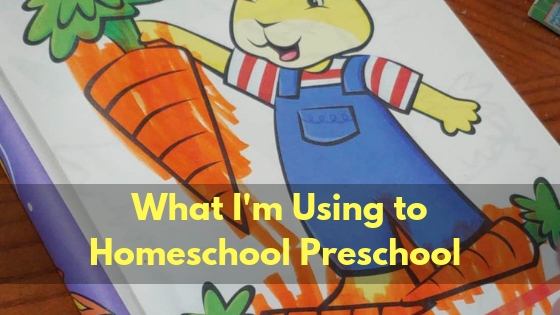 What do you do for preschool? Posted on January 22, 2019 by Ronda Bowen	• This entry was posted in Planning and Organization, Preschool. Bookmark the permalink.